Here are 4 free DIFF viewer software for Windows. There are many tools to see the difference between two text documents. However, such tools aren’t helpful to view the difference data separately of those documents. You need to open those files, again and again, in such DIFF viewer tools whenever you need to check the difference between them. Therefore, the free software covered here are handy. You can simply add the DIFF file and it will show the difference file data of those two documents. Do note that file difference may vary based on the DIFF file. For example, some DIFF file can show that particular content is missing in a specific line of the first file and the second file, unchanged data (in black color), etc., or some DIFF file may not show the unchanged content. So, this totally depends on how that DIFF file was saved. 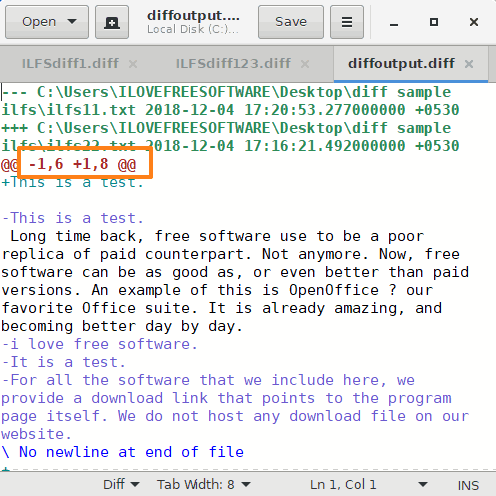 Let’s check these free DIFF file viewer software covered here. 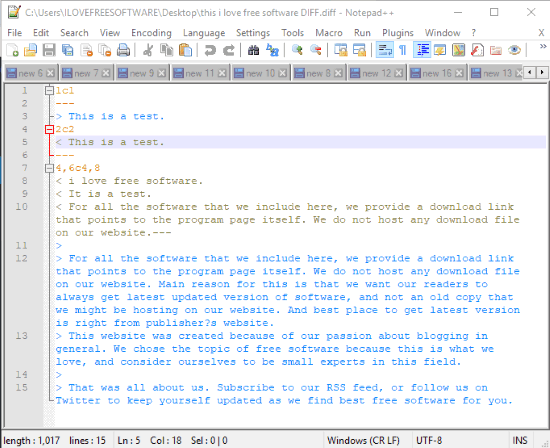 Notepad++ is one of the best DIFF file viewer software. Though the software is actually helpful to view and exit text document, source codes, etc., it is also pretty useful to view difference data of two text files. Simply add a DIFF file on its interface and it will show you the DIFF file data. As you can see in the screenshot above, it is showing that first file in the first line misses a particular content which is available in the first line of the second file and so on. The total content for first and second files is also visible in different colors. Apart from that, Notepad++ also helps you add folders as workplace, various plugins to perform different tasks, etc. Vim is an open source text and source code editor and it also provides the feature to view DIFF file content. In the screenshot above, you can see that it is showing the content of DIFF file. On the top of that content, it shows the number of lines present in both files and number of changes in each file. Here, the content with black color indicates the common content in both the files. The software also supports hundreds of programming languages. That means you can open files written in C, C++, or some other formats and do the editing. 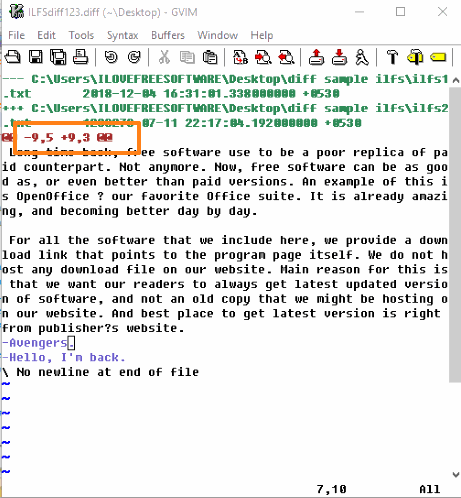 Gedit is another free text editor software which comes with many interesting features. It brings syntax highlighter, tabbed interface to open multiple files separately on a single interface, file revert feature, text wrap, auto indentation, bracket matching, and more. The feature to view DIFF file is also there. The content of input and output file is visible with different colors. The same content available in the same line for both the files is visible with black color. Other than that, you can also see the number of lines and the number of changes (changes removed and changes added) present in both files. 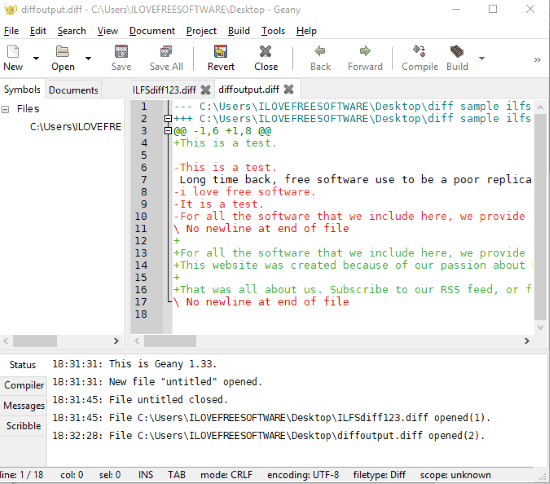 Geany is also a text editor and has features similar to Gedit software. It also lets you open multiple text documents on its interface with different tabs, count words, open some program file, etc. The feature to add DIFF file and view its content is also there. Like Gedit, it also helps to see the number of lines in first and second files, including the number of changes. The common text on the same line of both the files is also visible in black color. Other content for first and second files is visible with red and green colors. Here I close this list which covers some best free DIFF viewer software for Windows. Among all these software, Notepad++ is the best for me. The reason is I’m already using it and the feature to view DIFF file is also there. I don’t need to install any other software additionally. You may check all these software and check which one is good to view DIFF files.